"If the Nightingales could sing like you, they'd sing much sweeter than they do, for you brought a new kind of love to me". The opening phrases of Maurice Chevaliers' hit You Brought A New Kind Of Love To Me, used with good effect by the Marxes in Monkey Business and it's trailer Theatrical Agency (itself a remake of the opening sequence of I'll Say She Is), may have been a nod to their early days in showbiz as The Nightingales. It was probably brother Al Shean's success in vaudeville that convinced Minnie that her sons could make it in showbiz too. The first son chosen was Groucho, at the time possessor of an excellent boy-soprano voice. His first appearances was as singer in Protestant church halls in 1904-05 ("until they found out what was the matter with me"). 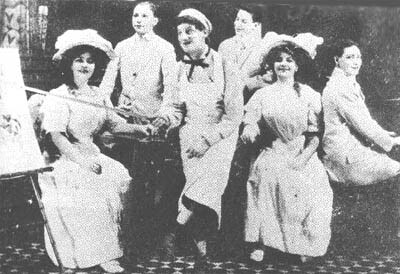 In 1905 Groucho made his first professional shows, touring both with Leroy Trio and British singer Lily Seville (as Lily Saville and Master Marx). Both tours ended with Groucho being abandoned out in the west with virtually no money. Around this time Gummo appeared in a ventriloquist act with Uncle Heinie who performed as Harry Shean. Between April and June 1906, Groucho appeared as one of Gus Edwards' Postal Telegraph Boys. This show, produced by vaudevillian Gus Edwards, consisted of eight boys in Postal Telegraph uniforms, indulging in "boyish pranks at one another's expense" and singing Edward's latest compositions in a telegraph office setting. Groucho's picture even appeared on the cover of the sheet music for Edwards' Farewell Killarney. By August Groucho was in the cast of a regular play, Man of Her Choice, embarking on a long tour. It ran through the winter of 1906-7, travelling from New Jersey up New England to Canada. Groucho appeared in a "kid" part as office boy Jimmy Armstrong. In the spring of 1907, Groucho and Gummo went to Ned Wayburn's College of Vaudeville. Wayburn was an impressario that had co-produced Gus Edwards' School act and at his vaudeville school the first signs of the performing Marx Brothers was visible. An article in New Jersey Sun from 14 April 1907 (quoted in Simon Louvish' Monkey Business) mentions some of the vaudevillian students, including "the Marks boys and little Mabel O'Donnell". Opening in Atlantic City in June, this trio performed as Wayburn's Nightingales until November. Another newspaper clipping unearthed by Louvish (from The New York Dramatic Mirror, September 1907), reviews them as "two clean-cut, good looking boys and a little mite of a girl with a voice that seems about ten times too large for her make up a most pleasing singing trio". But Wayburn ran into financial problems and Minnie took over as manager. An ad in Variety on 30 November 1907 announced THE THREE NIGHTINGALES, BIG HIT EVERYWHERE - MINNIE MARX, MANAGER. Mabel O'Donnell was cursed with either a squint or a glass eye and according to later reports of Groucho and Gummo, this affliction (hidden by a wig supplied by Minnie) extended also to her sense of key. Mabel reportedly also had a crush on Groucho making her rather a nuisance at times and maybe this was the main reason why Minnie replaced her with Brooklyn-born Lou Levy in June 1908. Very little is known about Levy, who (Glenn Mitchell mentions in his Encyclopedia) also called himself Leo Levin. About the same time the group was amended to a quartet with the addition of Harpo. The Four Nightingales were born. "I was being shanghaied to join Groucho, Gummo, and Lou Levy. On a stage. Singing. In front of people", Harpo wrote in his autobiography. For more than a year, until September 1909, the Four Nightingales were touring the boondocks west and south and comedy began creeping into the act. Groucho donned a butcher boy's smock and carried a sausage dangling out while he sang in a comic German accent. Appearing as Hans Pumpernickel, Groucho asked the other boys how to get to Mrs. Schmidt's house. While one of the guys pointed him in one direction, the others stole the wieners. When remembering this routine in the 1970s, Groucho said "I went from bad to wurst". Another piece of dialogue consisted of Harpo saying "Yonder in the distance an island lays", prompting Groucho to ask "Lays what? Eggs?". "No", Harpo answers, "lays on the bosom of the ocean". "Oh, what a fresh island!" Groucho concluded. 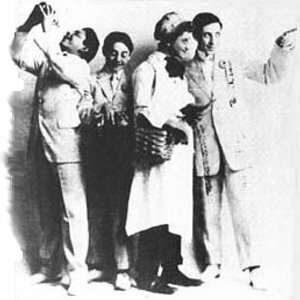 Regarding the repertoire of the Nightingales, Gummo told Richard Anobile in The Marx Brothers Scrapbook that they "would sing what were the popular songs of the day - until we sang them". Groucho and Harpo has named songs like Love Me and the World Is Mine (a solo number for Mabel O'Donnell) , How'd You Like To Be My Little Sweetheart, Darling Nelly Grey, Mandy Lane and Groucho's German item Ist das Nicht Ein Schnitzelbank. In order to balance Groucho's specialty, Harpo developed a solo piano spot, playing The Holy City in seven variations from waltz to ragtime. Harpo also played some mandolin with Gummo and if the audience wasn't paying enough attention, they all led a group-sing of Dixie. In the early 20th century, Chicago was the major vaudeville centre outside New York and some of the newly born film companies (like Essanay Studios) were also based in Chicago. This was the place to be, mother Minnie decided, and moved there from New York with her family (including her sister Hannah with husband Julius Schickler) in October 1909 (see The Marx Brothers in Chicago). Very soon after her arrival in Chicago, Minnie Marx changed identity and became the theatrical entrepreneur Minnie Palmer. There was an original Minnie Palmer, a well-known American singer that at the moment was living in England. Whether Minnie Marx adopted the famous name Minnie Palmer in ignorance or in guile is a matter of opinion but she didn't stop anyone from jumping to their own conclusions. The existence of two Minnie Palmers confuses archivists to this day. The new Minnie Palmer established herself as "Chicago's only woman producer", and produced several other acts. "The more people we had in the act, the more we'd be paid", Groucho has said, and this may explain why even Minnie herself took it to the stage. An appearance in Dayton, Ohio on 14 August 1909 was advertised as Minnie Marx and her Four Nightingales, and between February - May 1910 the singing group was touring as Minnie Palmer's Six Mascots, including not only Minnie but also Aunt Hannah. Aged 42 and 44 respectively, they were appearing as two little schoolgirls, armed with guitars and singing Two Little Girls in Blue as a duet. Their stint as Mascots came to an end when they proved to have sufficient weight for the chairs on stage to collapse. It was also during this period (maybe when the Marxes moved to Chicago?) that Lou Levy was replaced by a boy named Freddie Hutchins. Both in his autobiography Groucho and Me and in The Marx Brothers Scrapbook, Groucho has told a story from these days involving a "fresh kid" in their act named Freddy. This may refer to Freddie Hutchins. As the story goes, Freddy was appearing with the Marx brothers in Cincinnati at the same time as a burlesque show. They were very interested in the girls from that show and gladly accepted an invitation from the manager to a free dinner in honor of the leading lady. The manager (according to Groucho a sixty-year old man) was hopelessly in love with the flabby leading lady (who was forty-five according to the autobiography, "really about 50!" according to the Scrapbook). The drunken manager got up to make a speech about his wonderful, fat-hipped lady, including the statement "It is hard to believe that this little lady has achieved all this success at the tender age of thirty". At this point Freddy stood up and in a loud, clear voice announced; "Oh yeah? I'd hate to hang for every year she's over forty!". For a moment there was a dead silence, then the manager grabbed the knife to cut the cake and started to chase Freddy, Groucho, Gummo and Harpo. "To the citizens of Cincinnati it must have seemed strange to see fifty assorted semi-drunken males and females chasing four boys down the main street of the city", Groucho wrote and added, "Later that night we took care of Freddy and proved to him that honesty is not always the best policy." Harpo (in Harpo Speaks!) and Kyle Crichton (in The Marx Brothers) both indicates that another female performed as a Nightingale/Mascot after Mabel O'Donnell had left but before Aunt Hannah had joined. Both Harpo and Crichton have a reputation among Marx scholars to be not entirely reliable but it may be interesting to recall their clues. None of them mention Mabel O'Donnell by name, but they start off by describing a girl singer with the same eye- and key-problems that Mabel reportedly had. In Crichton's book this girl stays with the Marxes for a number of years, at least until the act had metamorphosed into Fun In Hi Skule, and Harpo mentions that he was a Nightingale/Mascot alongside her (whereas Mabel O'Donnell was replaced by Lou Levy even before Harpo joined the act). Crichton calls this character Janie O'Riley, while Harpo names her Jenny. Harpo describes her as "a grand gal, except that she was a nymphomaniac" who "prowled hotly after everything in long pants", which doesn't sound like other descriptions of Mabel O'Donnell at all. Jenny the Nymphomaniac reputedly didn't consider the Marxes a "fair game" though, as they were still "a boy's act and wore knee pants" (although the fact that Harpo joined the act when he was twenty years old makes the knee pants-bit another source of doubt). Harpo claims that they got rid of Jenny somewhere in Texas; "By mutual agreement of the Marxes and whatever town we were in, she was asked to leave - leave the state of Texas altogether, preferably. Still we felt sad when the sheriff excorted Jenny down to the station and the northbound train pulled in, sad and a little guilty too. But when the train pulled out we didn't feel so bad. Jenny waved us a cheerful farewell - from the cab of the engine, where she was sitting on the engineer's lap." According to Harpo, it was at this point that Minnie sent a telegram to Aunt Hannah for her to join the group. I guess we'll never know for sure if she did replace a promiscous girl-Mascot or if Jenny/Janie O'Riley was just a mythical, extended version of Mabel O'Donnell. The whereabouts of Chico, the eldest Marx brother, between 1908 and 1910 are not exactly known. He had been playing piano at nickelodeons, dance halls and saloons and also worked for a time with the song-publishing firm of Shapiro, Bernstein and Company in Pittsburgh. Together with young singer Arthur Gordon, he then began his own career in vaudeville. Around this time, Chico adopted the famous Italian accent (which he - according to legend - took from his barber). Arthur Gordon also took an Italian alias and Gordoni and Marx hit the road with a piano and singing act with bursts of ethnic ribaldry. In the summer of 1911, Chico had a new partner, cousin Louis Lefevre, the son of Aunt Hannah, who appeared on stage as Lou Shean. Lou reportedly sported a "Dutch makeup", but didn't "dabble" at all in German. Harpo has described cousin Lou as "a plain-looking guy who wore thick glasses, but he could sing along with the best of them. During part of their act, Chico would accompany Lou blindfolded on the piano". On 19 May 1912, John J. O'Connor ("Wynn") wrote in Variety that "Shean and Marx have separated as a vaudeville team and Leonard Marx, who played piano in the former offering, has doubled with George Lee, ex-comedian with the Arlington Four". According to Louvish, the last appearance of Marx and Lee was on 9 August 1912 and in September they both joined Mr Green's Reception, the latest mutation of the Marx Brother's School Act.